Crabgrass is a summer annual that grows in a clump or mat and has many branches and stems. It has pale blue-green leaves with a purplish tinge and margins that may be rough. Seed stalks appear in August and September and have 2 to 6 finger-like, purplish spikes up to 4 inches long. To control without chemicals maintain turf density and health, avoid light, frequent irrigation and short mowing. It can also be easily hand pulled. Crabgrass will die off with the first frost of the fall. Annual bluegrass is a winter annual that grows from fibrous roots to form dense mats of grass that grow prostrate to erect. Leaves are apple green, 1/2 to 3/4 inch long, and 1/25 to 1/5 inch wide. Annual bluegrass occurs on wet, compacted soils and in cool temperatures and lacks tolerance to environmental extremes. To control without chemicals maintain turf density and health. Avoid over-watering and compacted soils. Since annual bluegrass is a winter annual, pre-emergent herbicides need to be applied late summer or early fall before seed germination has occurred. There are no selective post-emergent herbicides available. Goosegrass is a summer annual that usually emerges a few weeks after crabgrass. 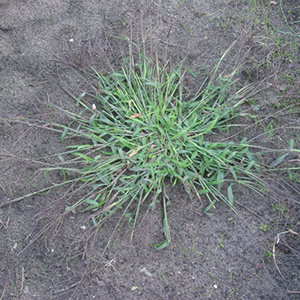 Goosegrass is a coarse bunch-type grass that forms a basal rosette of prostrate flattened stems up to 2 feet long. The stems do not root at the node. The root system is fibrous and the lower portions of the stems near the base are silver or white. 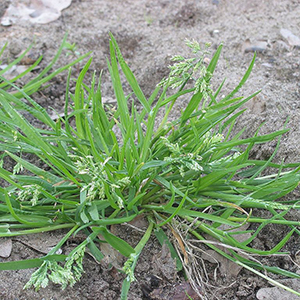 Goosegrass shows up mid-season and is usually found in lawns with full sun, hard compacted soils and poor drainage. Goosegrass is commonly found along driveways and walkways. Will tolerate close mowing. To control without chemicals maintain turf density and health, avoid light frequent irrigation, close mowing or scalping and reduce compaction in the soil. Goosegrass will die off with the first frost of the fall. Chemical controls work best by applying a pre-emergent herbicide before germination occurs in the spring. If past infestations have occurred or if the lawn is thin a second application of pre-emergent may be needed early summer as well. Post-emergent herbicides are available but do not work as well as pre-emergent herbicides. Yellow foxtail is a summer annual that germinates late in the spring. Foxtail forms a coarse, upright, bunch-type grass. It usually branches at the base and may root at lower nodes. Also has a fibrous root system and normally has flattened stems that are reddish near the base. Leaves are flat, smooth, and have margins that are somewhat rough. 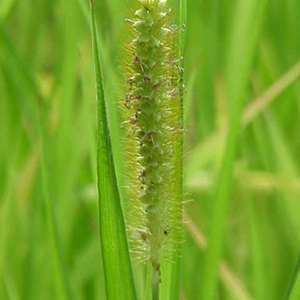 Foxtail often grows in newly seeded lawns, bare spots and areas of open turf exposed to the sun. Likes moist, fertile soil. To control without chemicals hand pull, maintain turf density and health and avoid close mowing or scalping. Foxtail will die off with the first frost of the fall. 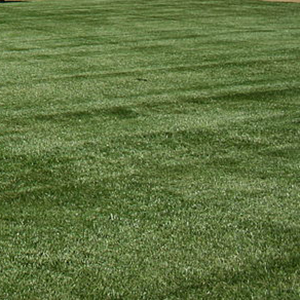 Tall fescue is a perennial that forms clumpy, coarse, bunch-type grasses with a deep root system. Leaves are flat, dark green and up to 1/2 inch wide. The upper surface has distinctive veins and the margins are rough. Tall fescue tolerates a wide variety of settings and environments. It is very durable and drought tolerant. Under dry weather conditions it will still be actively growing and green when other grasses have gone dormant. To control without chemicals maintain turf density and health. There are no pre-emergent herbicides available. For post-emergent control use a non-selective herbicide. Quackgrass – © Douglas Ladd. 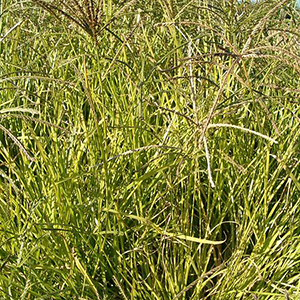 Quackgrass is a coarse textured perennial that spreads by white fibrous rhizomes. Root hairs ring the rhizomes about every inch. Leaves are a dull green to light blue-green and are flat with rough margins and may be sparsely hairy on the upper and lower surface. It develops claw-like slender auricles that clasp the stem. Quackgrass is an aggressive grass found in lawns throughout the growing season and thrives in well drained soils with slightly acidic pH. It also favors thin lawns under stress. To control without chemicals maintain turf density and health. Mowing low may help reduce quackgrass population. There are no pre-emergent herbicides available. For post-emergent control us a non-selective herbicide. Nimblewill is a warm season perennial that forms dense patches of grass by spreading stems that root at the nodes. It has fibrous roots and short, flat, blue-green leaves. Nimblewill favors moist soil and will grow in sunny and shady areas where commonly grown turf grasses are poorly adapted. 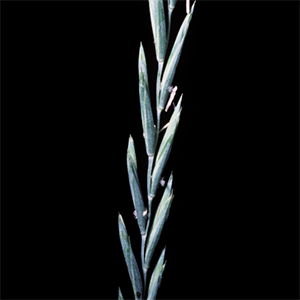 Being a warm season grass nimblewill is dormant from mid-fall through late spring. When dormant it is a faded dull brown. To control without chemicals maintain turf density and health. Niblewill is often a problem in areas where commonly grown turf grasses are poorly adapted so modifying growing conditions by improving drainage and reducing shade will help desirable turf grasses compete. To control with chemicals use a non-selective post-emergent herbicide when the grass is actively growing. Yellow nutsedge is a warm season perennial that reproduces by seeds and tubers. 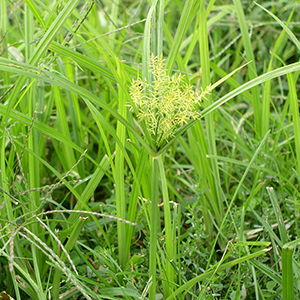 It has yellow-green, upright, grass-like leaves that are 3-sided with a prominent mid-vein. Yellow nutsedge will grow in all soil types, prefers pH levels of 5.0 to 7.0 and especially likes wet and moist sites but will grow in dry sites when established. To control without chemicals maintain turf density and health. If there are not too many plants they may be easily removed by hand. Increase drainage in wet areas and mow high. 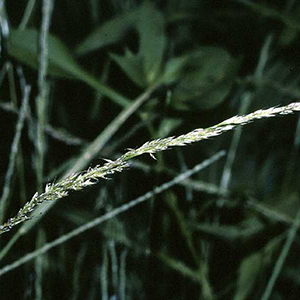 There are selective control herbicides available for the control of nutsedge. Contact your local co-operative extension service to see what products are registered in your area. Creeping bentgrass is a cool season perennial that spreads by vigorous above-ground stems and forms dense mats that will choke out desirable grasses. Leaves are thin, blue-green with prominent veins, flat and rough. 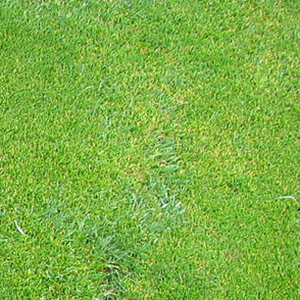 Creeping bentgrass prefers moist, fertile areas of the lawn where grass is closely mowed and can occur anytime during the growing season. To control without chemicals maintain turf density and health. Avoid mowing too short and over-watering. Canada thistle is a perennial weed that forms large, coarse plants with spiny leaves that are long, narrow, oval and with crinkled edges. Canada thistle reproduces by seeds and rhizomes. 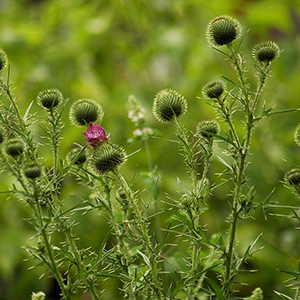 Canada thistle can appear anytime during the growing season. It can especially be a problem in landscape beds and gardens, spreading rapidly to turf areas. Post-emergent selective herbicides can be applied anytime the weeds are actively growing but may be very difficult to eradicate because of its tendency to be a prolific seeder. Common purslane is a summer annual that emerges from a heavy taproot to develop succulent, smooth, stems that are purple-red and root at the lower nodes. It grows in a many stemmed prostrate fashion to form mats and may reach a length of 20 inches. Leaves are small, oval, smooth and often clustered near the ends of the branches. 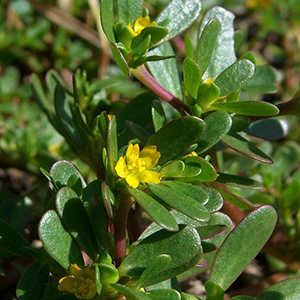 Once established common purslane is drought tolerant and tends to grow in thin areas around curbs, driveways and walkways. To control without chemicals maintain turf density and health. If there are not too many plants they may be easily removed by hand. Since common purslane is an annual apply pre-emergent herbicide late spring for control. For post-emergent control, selective broadleaf herbicides may be applied anytime the weeds are actively growing. 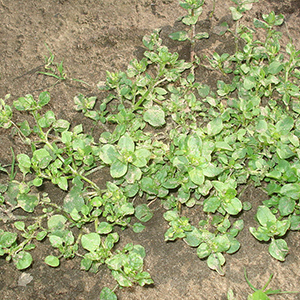 Common chickweed is a winter annual that is low-growing and can form large, dense patches. It has creeping stems that root at the nodes and produce shallow, fibrous roots. Leaves are small, bright green, opposite and oval. Common chickweed can be found in the spring and fall in cool, moist , shady areas where desirable turf-grasses are sparse. Will typically die out with the heat of summer and drier soil. To control without chemical maintain turf density and health, improve soil drainage and reduce shade. Pre-emergent herbicides should be applied late summer/early fall before germination. For post-emergent control, selective broadleaf herbicides may be applied anytime the weeds are actively growing. Curly dock is cool season perennial that develops a dense rosette of large long leaves that are heart-shaped at the base, have short petioles and have wavy/curly edges. Curly dock also has a large, fleshy taproot on a short crown. 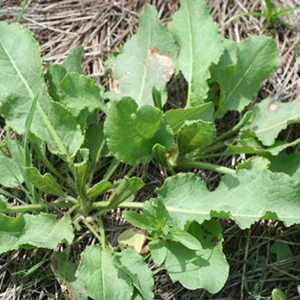 Curly dock is commonly found in very poor compacted soil, waste areas or low maintenance turf areas. To control without chemicals maintain turf density and health. For post-emergent control, selective broadleaf herbicides may be applied anytime the weeds are actively growing. Dandelions are a cool season perennial that have a long, sturdy tap root and form basal rosettes with deeply lobed leaves. Dandelions have distinctive yellow flowers up to 2 inches in diameter borne on hollow stems that can reach up to 20 inches high. Flowers ripen into wind-dispersed seeds that resemble round “puffballs” . 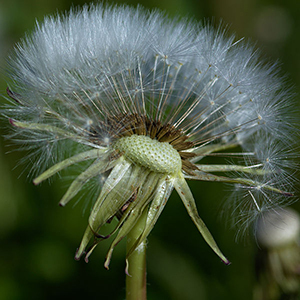 Dandelions occur in most lawns anytime throughout the growing season. To control without chemicals maintain turf density and health and mow often enough that you remove the seed heads before they mature. For post-emergent control, selective broadleaf herbicides may be applied anytime the weeds are actively growing. Ground ivy is a cool season perennial that forms dense patches. It is a “viney” weed that creeps on square stems that can grow 3 to 4 feet. Leaves of ground ivy have a rounded toothed margin, may be smooth or hairy, dark green, opposite, kidney shaped, and about an inch in diameter. Flowers are small, blue-purple, funnel shaped and clustered in leaf axils. Ground ivy prefers shaded areas of the lawn that are moist but will grow into sunny areas. To control without chemicals maintain turf density and health. Modify growing conditions to improve soil drainage and reduce shade allowing desired turf-grasses to compete. For post-emergent control, selective broadleaf herbicides may be applied anytime the weeds are actively growing. 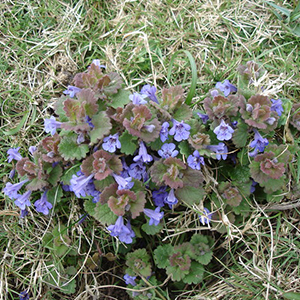 Ground ivy may be difficult to control and is often used as a ground cover in shady areas. Henbit is a winter annual that has stems that are green to purplish color, droop and then turn upright and grow, may be smooth or hairy and root where they touch the ground. Leaves have rounded teeth, crinkled edges, are dark green, oval and about 1/2 inch long. 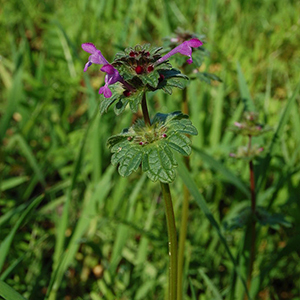 Henbit flowers are tubular, pink, red or purple in color and appear April through June. 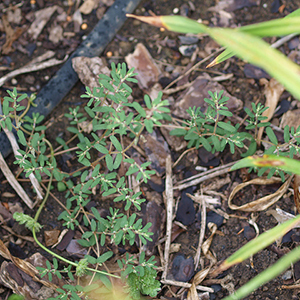 Prostrate spurge is a summer annual that develops a central taproot from which prostrate stems form a flat, extensively branched mat up to 2 feet in diameter. When the stems are broken they exude a milky sap. Leaves are hairy, opposite, small and purplish. Prostrate spurge grows in thin, drought stressed areas of the lawn. Typically found along driveways, sidewalks and high traffic areas that have compacted and/or rocky soils. It is very drought tolerant and grows well in hot, dry weather. To control without chemicals maintain turf density and health, water deeply and avoid close mowing or scalping. If there are not too many plants spurge is easy to remove by hand. Pre-emergent herbicides should be applied in the spring before germination. For post-emergent control, selective broadleaf herbicides may be applied anytime the weeds are actively growing. 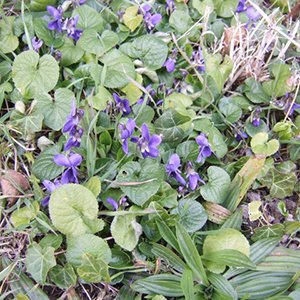 Violets are a perennial weed that form dense patches by spreading rhizomes. Leaves are shiny, oval with heart-shaped bases, about 2 inches wide, cupped and have toothed edges. Flowers are purple and the petals are hairy near the base. Violets prefer moist fertile soil. They are very shade tolerant but will grow in sunny areas also. For post-emergent control, selective broadleaf herbicides may be applied anytime weeds are actively growing. Common violets are very difficult to control. White clover is a cool season perennial that forms dense patches from a fibrous root system. It can root at nodes on creeping stems. Leaves are composed of 3 un-stalked oval leaflets. They are dark green with faint, white crescent-shaped markings. Flowers are a ball-shaped white cluster about 3/4 inch wide. Numerous flowers appear May through September. 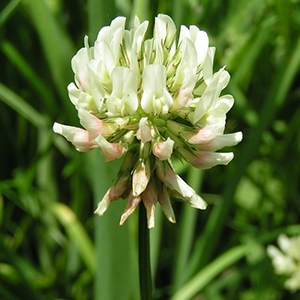 White clover favors moist soil conditions and will grow in shady or sunny areas of the lawn. For post-emergent control, selective broadleaf herbicides may be applied anytime weeds are actively growing. Broadleaf plaintain is a cool season perennial that forms a spreading basal rosette. Leaves are dark green, smooth, broad and oval. The petioles are purplish and the leaf margins wavy. 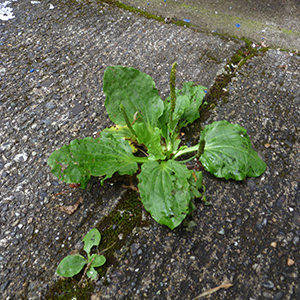 Plantain prefer wet soil in sunny locations but will tolerate some shade. Post-emergent selective herbicides can be applied anytime the weeds are actively growing.